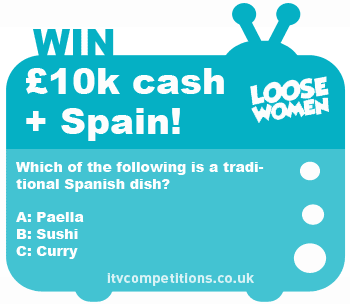 Loose Women competition - win £10k cash + 7 night holiday to Spain! Loose Women competition – win £10k cash + 7 night holiday to Spain! Which of the following is a traditional Spanish dish? Enter the Loose Women competition for free 6 times per phone number via itv.com competitions entry page. Entering via phone will cost over £1.50!